For a guy who piles up more ice time than an Antarctic scientist, Eric Bigaouette sure doesn’t seem concerned about conserving his energy. 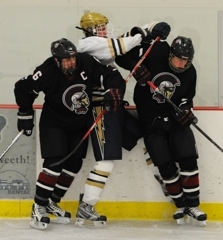 Bigaouette, a senior defenseman, isn’t afraid to grab the puck and go. He’ll skate at top speed, weaving through opposing defenders as if they were traffic pylons, until he creates a scoring opportunity. He’ll play some defense, too. A football player in the fall, Bigaouette admitted it took him some time to transform his football legs into ones more suitable for skating. After his performance against the Trojans, consider the transformation complete. 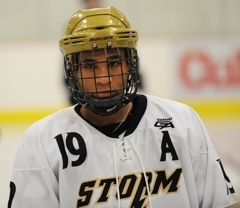 The slender Bigaouette went end-to-end on a power play to set up Jake Anderson for the Storm’s first goal. Then, with players from both teams running out of gas, Bigaouette appeared to be brimming with energy as he stole the puck in the neutral zone and again made a dash into the Trojans’ end. All of this came with the Storm (8-2-0) shorthanded and trailing by a goal. Eklund’s tap-in goal came with 75 seconds remaining and pushed the game into overtime. 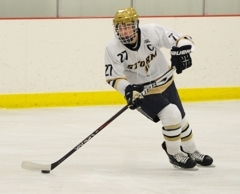 Senior forwards Connor Kelly and Nate Traina typically do the bulk of the Storm’s scoring. Kelly had 14 goals and 12 assists to lead Chanhassen. 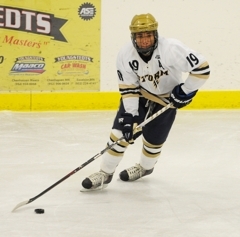 Traina is second on the team in scoring with 18 points (seven goals, 11 assists). 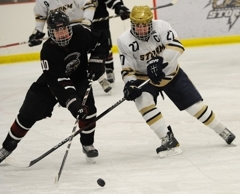 The duo combined for a single assist against the Trojans, who feature a deep, skilled defensive corps and standout goaltender in senior Joe Morris. Perhaps the most intriguing race to a conference championship in the state this season will be staged in the Missota, a league notorious for its lack of drama. Holy Angels has won the last 13 straight Missota Conference titles, but the young Stars (3-10-0) already have lost to Chanhassen in a season that, seemingly, could see their stunning run of league dominance come to an end. New Prague, for many seasons the No. 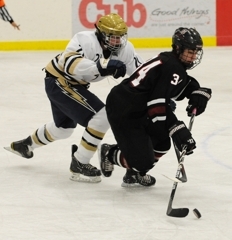 2 team in the Missota, dropped to 3-3-0 in the conference with Tuesday’s 3-2 overtime loss to Chanhassen, the team with the best chance to unseat the Stars. The Storm already have defeated the Stars this season en route to a 4-0-0 league record. 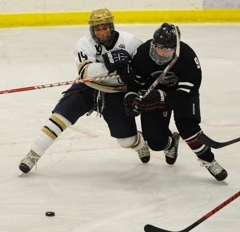 The only top league team Chanhassen has yet to play is Red Wing, which is 4-1-0 in the conference. 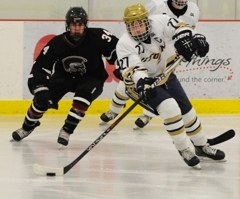 Meanwhile Chanhassen, in its second season as a varsity program, couldn’t be in better position. 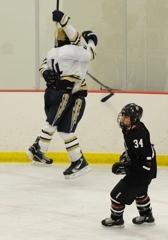 Senior forward Jackson Spingler scored a rebound goal with 2 minutes, 8 seconds left in overtime to lift Chanhassen to a thrilling 3-2 victory over New Prague on Tuesday, Jan. 10, in a Missota Conference showdown at Victoria Recreation Center in Victoria. 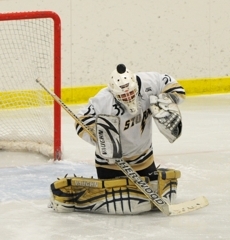 Spingler’s goal came after Kent Eklund’s initial shot from the point was stopped by New Prague goaltender Joe Morris. The puck ended up to the right of the crease, where Spingler alertly swatted it into an open net, setting off a wild a celebration on the ice as the Storm bench emptied and teammates mobbed Spingler in the corner. 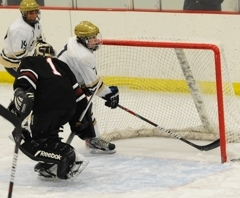 It was a stunning finish, considering New Prague (6-7-1) looked to have the victory wrapped up after senior Jordan Holicky scored a power-play goal with 2:26 left in the third period. 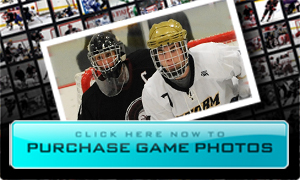 With 2:03 remaining, the Storm’s comeback hopes dimmed even more when senior and top scorer Connor Kelly was called for a head contact penalty. 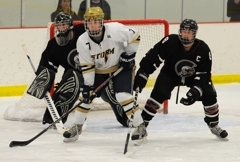 Ecklund tied the game at 2 with 1:15 remaining when he tapped in a pass from defenseman Eric Bigaouette, who pounced on a turnover and wheeled into the Trojans’ zone, beating two New Prague defensemen to the crease. Bigaouette also set up Jake Anderson’s second-period goal with an end-to-end rush. 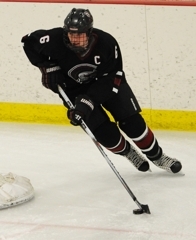 New Prague defenseman Jack Pexa scored the lone goal of the first period with a blast from the point. 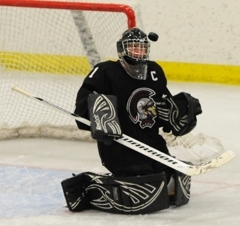 Morris made 27 saves, including 6 in the overtime period as Chanhassen (8-2-0) outshot the Trojans 7-1. 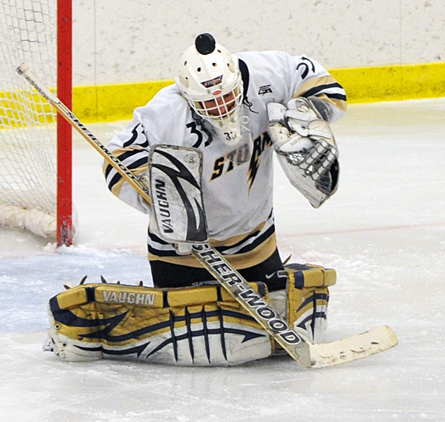 Storm goaltender Harlin Paradise made 25 saves. Trailing by 1, playing shorthanded and watching the clock wind down to less than 2 minutes in regulation, the Storm appeared to have little chance of rallying to tie New Prague, much less beat the Trojans. 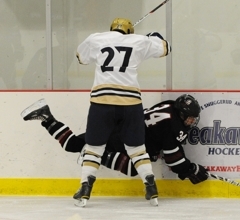 Then Bigaouette stole the puck in neutral ice, swerved right, zoomed past two New Prague defensemen and sped to the front of the net, where he dished a pass to Kent Eklund for an easy tap-in that tied the game 2 with 1:15 left in the third period. 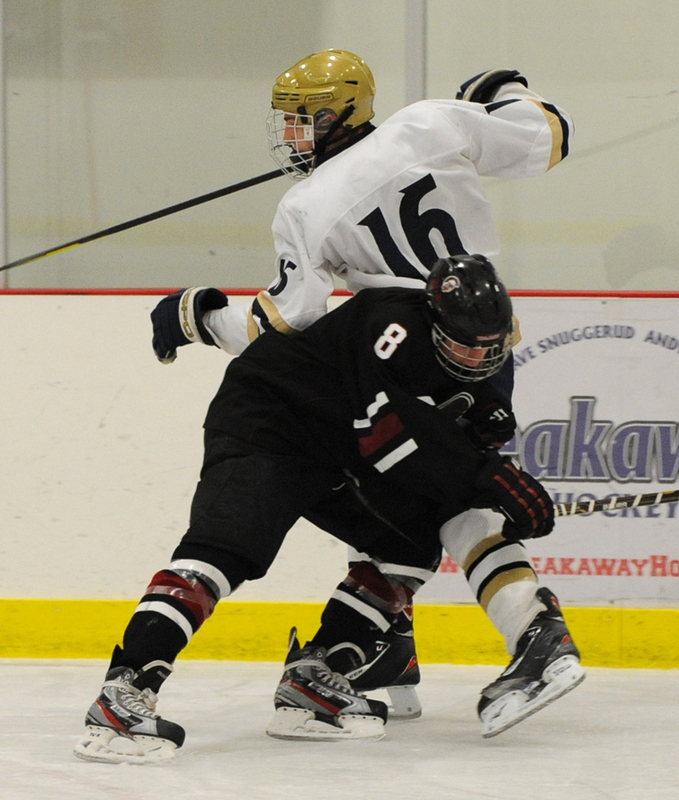 A senior defenseman, Bigaouette also went end-to-end in Bobby Orr fashion to set up a second-period goal by Jake Anderson. The overtime hero, Spingler made no mistake in slamming home a rebound in heavy traffic in overtime to give the Storm the dramatic come-from-behind victory. 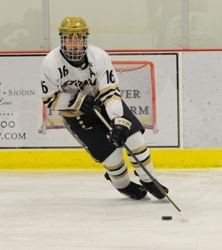 A senior forward, the goal was Spingler’s fifth of the season. 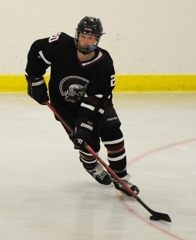 Holicky, a senior forward, drew a penalty on a great scoring chance in the closing minutes of the third period, then scored on the ensuing power play with 2:26 remaining to give the Trojans a 2-1 lead and apparent victory.